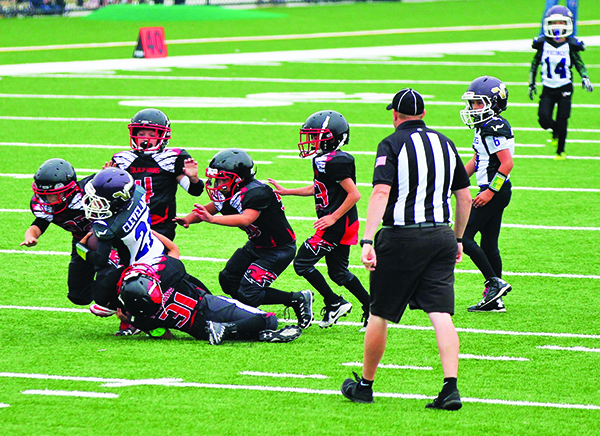 89ers Bryson Fryberg and Derek Wilson forcing a QB sack. 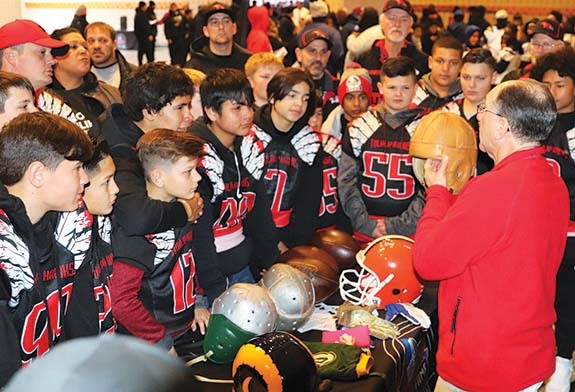 Last year, for the first time in nearly fourteen years, Tulalip began an initiative to have its own youth tackle football program. 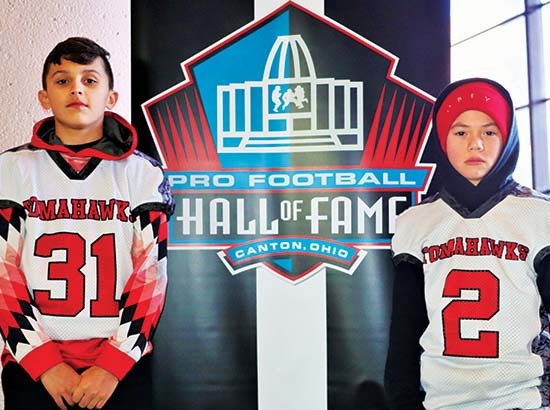 Under the careful guidance of Youth Services employees Lonnie Enick and Josh Fryberg, the Junior Hawks program kicked off with a single team of 9-12 year olds who played during the 2017 season. 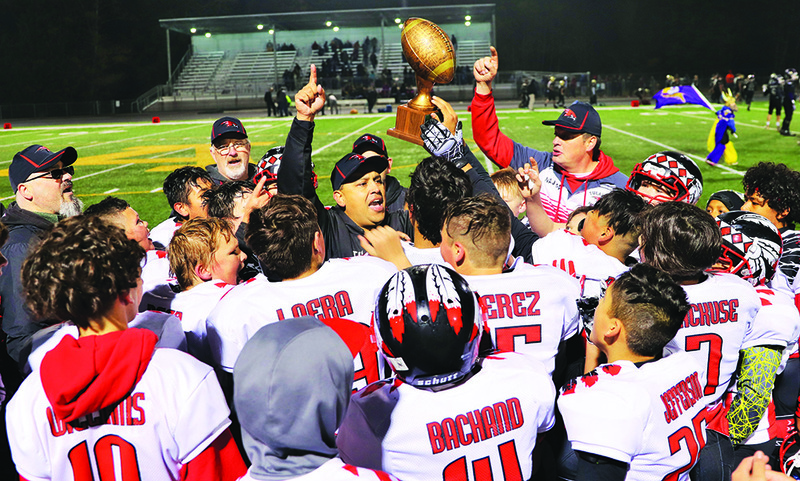 That lone team was the spark that ignited a flame, attracting many more aspiring Tulalip football players for the 2018 season. 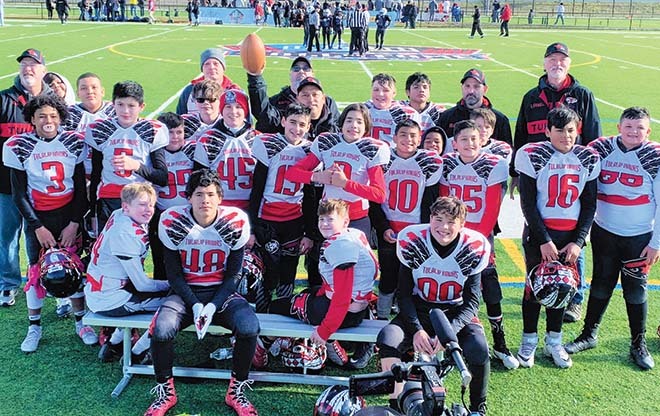 Now in its second season, the Junior Hawks youth football program has grown from having just the single team to having five teams, each separated by age level; Peewees, 89ers, Juniors, Bantams, and Seniors. 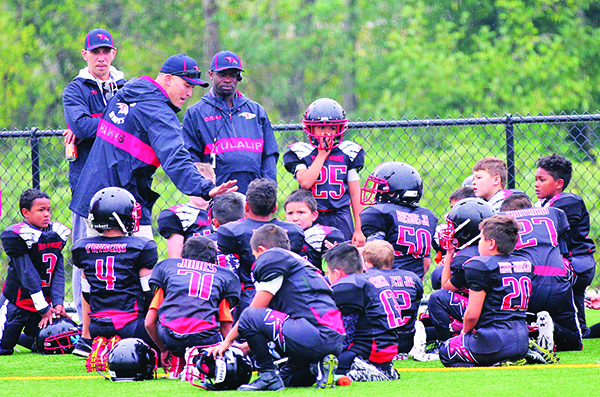 Each team is comprised of mostly Tulalip tribal members. 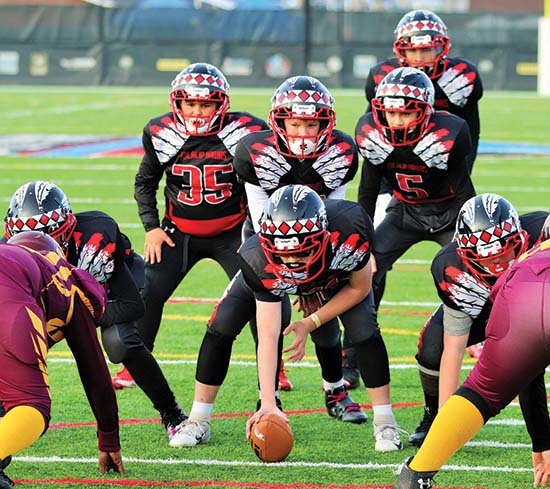 These youth, who before were only able to play football under the banners of Marysville or Everett, now proudly sport stylish uniforms that read Tulalip Hawks. 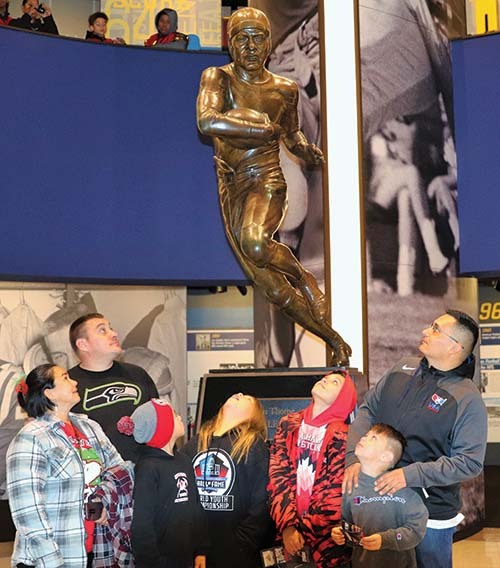 Tulalip sought and received acceptance into the North Sound Junior Football League, legitimizing the program as a whole and establishing themselves as the official feeder program for the reservation’s Heritage High School. 89er coaches reviewing the game plan at halftime. 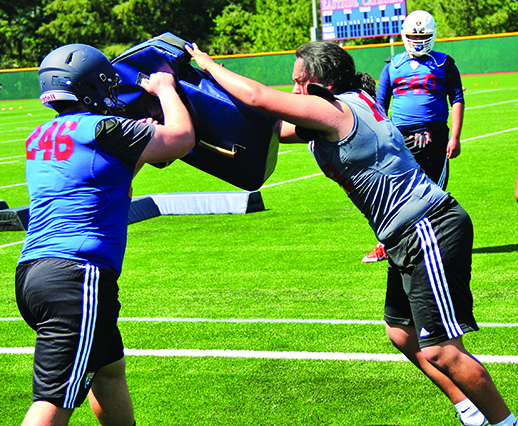 Right – Bryson Fryberg and Derek Wilson forcing a QB sack. Below – J.J. Gray throwing for a TD. 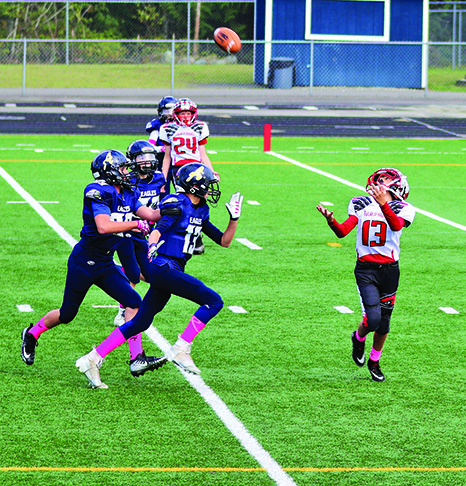 This season’s campaign kicked-off on Saturday, August 25, with four of the Junior Hawks teams playing home games at the youth center versus Lake Stevens teams. The 89er division got things started with a 9:00am game. 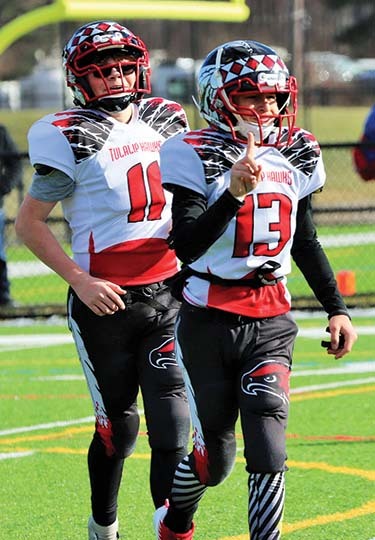 Quarterbacked by tribal member J.J. Gray and coached by his father O’Mar Gray, the Junior Hawks executed their game plan flawlessly by dictating tempo on both sides of the ball. Offensively, J.J. looked like a young Mike Vick running quarterback options and routinely juking multiple defenders as he left the pocket for long runs. Meanwhile, the defense was giving up nothing on the ground or through the air. 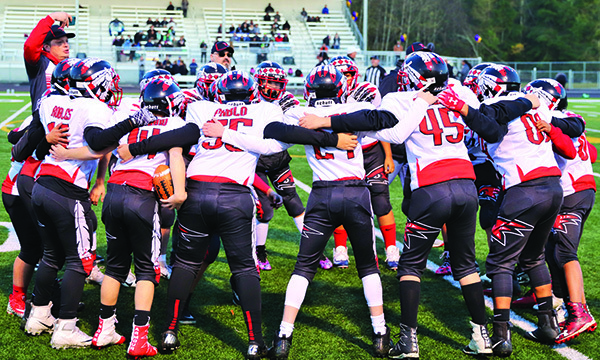 Several Junior Hawks players, like Bryson Fryberg and Derek Wilson, were able to overpower their Lake Stevens counterparts and come up with multiple quarterback sacks. 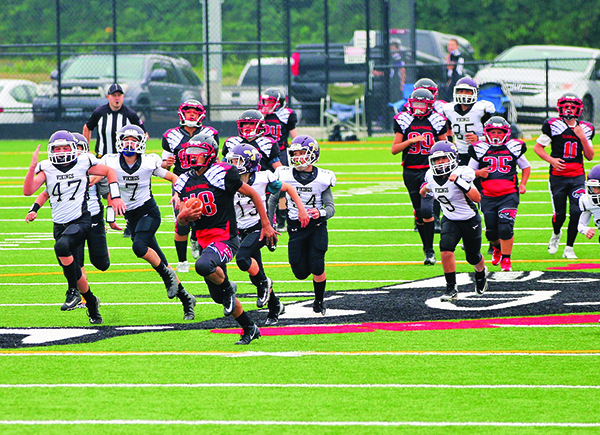 At halftime the Jr. Hawks were up 21-0, giving the home crowd much to cheer about. 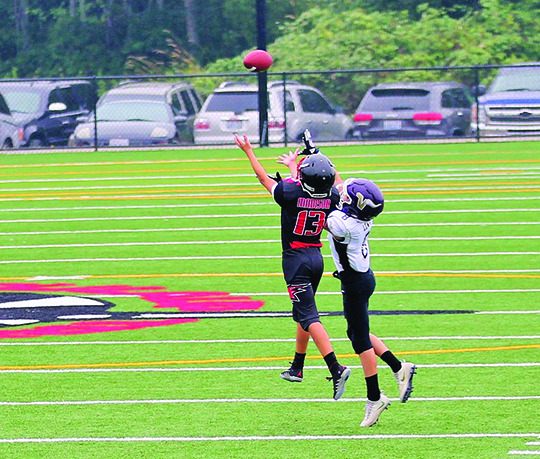 They would tack on another touchdown for good measure in the second half on their way to a well-earned 27-0 victory. 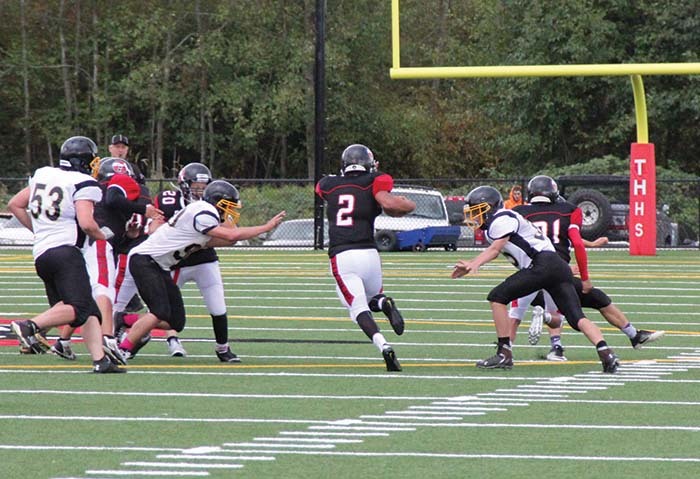 Bantam squad’s Gio Vega-Hillaire shreds Lake Stevens with the ground game. 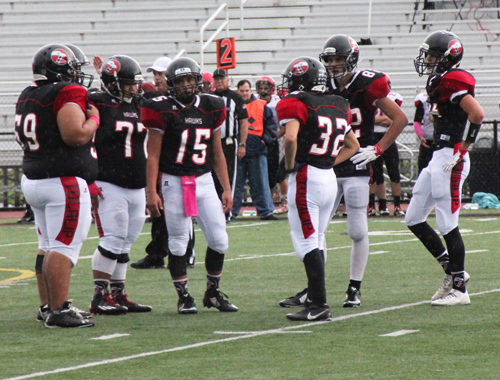 Following the 89er game, the Junior Hawk Bantam squad took to the field. 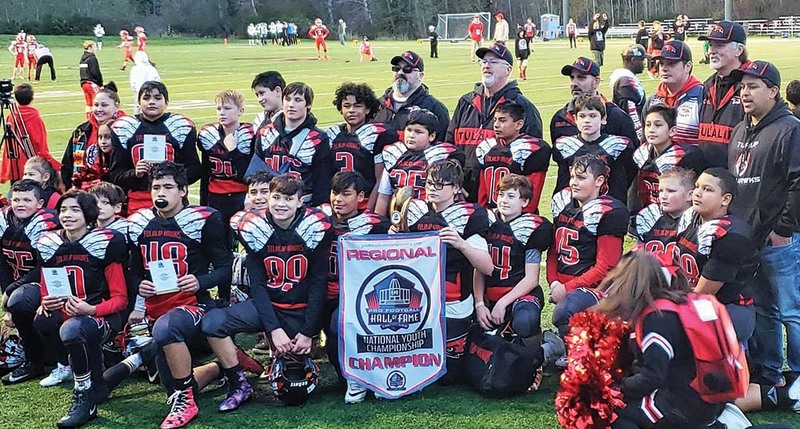 Prepared by long-time coach James Madison and led by a crop of highly talented 12-year-olds, this team walked on the field with high expectations. 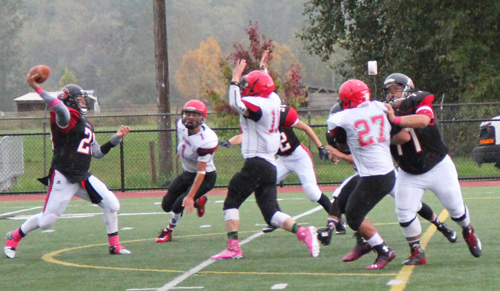 They set the tone early unleashing a variety of offensive formations that Lake Stevens was unprepared to defend. 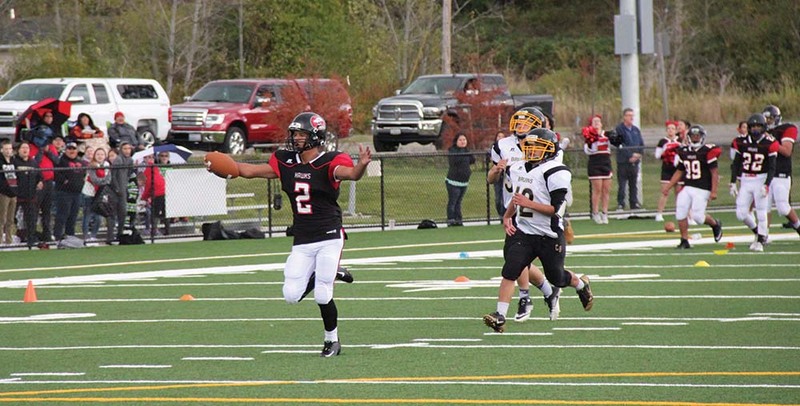 Players Gaylan Gray, Gio Vega-Hillaire, and Jayden Madison all scored touchdowns early as their team took a commanding 26-0 lead. Their defense would force several 4th-down stops and the offense never let off the gas, eventually winning with a lopsided score of 57-14. 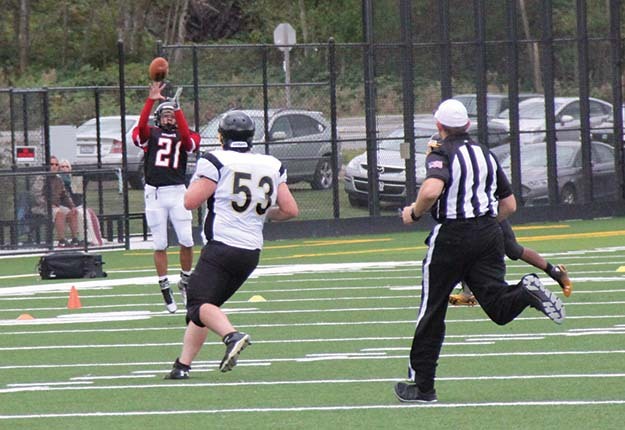 Jayden Madison coming up with a clutch interception. 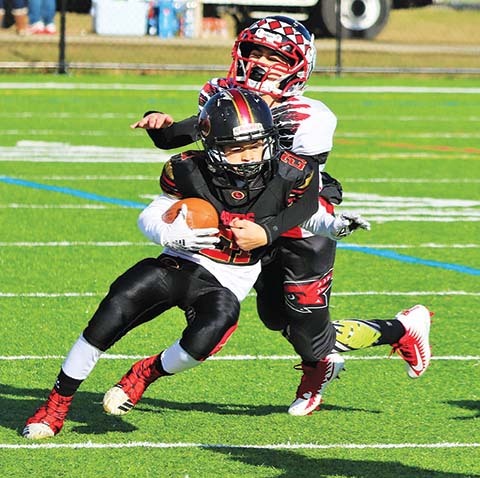 The dominant victories by both the 89ers and Bantam teams give the Junior Hawks program high hopes for the season and expect to see a champion crowned at the end of the season. 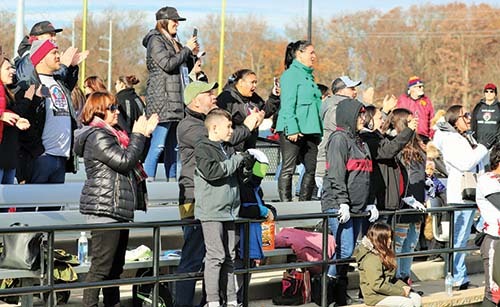 All in all, the program consists of five teams, over 125 athletes, and thirty volunteers. 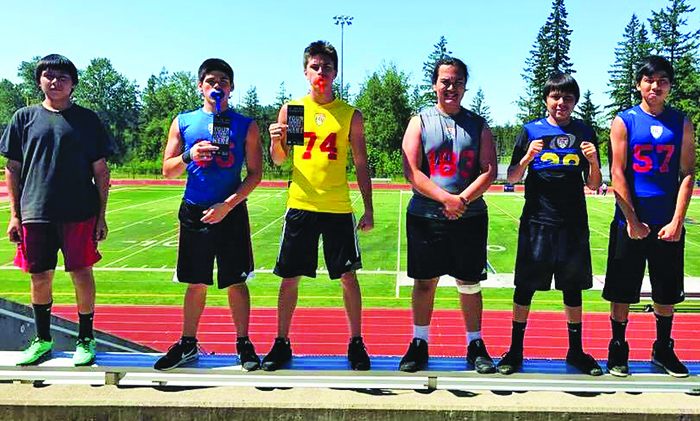 During the hottest weekend of the year, the mid-80 degree days of May 27 and 28, six inspiring athletes from Tulalip were having their athletic prowess put to the test at Football University’s two-day camp. 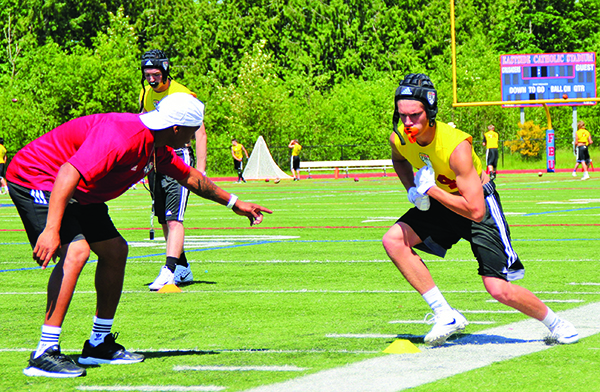 Hosted at Eastside Catholic School, located in Sammamish, the intense football skills camp delivered by the heralded Football University provided an intense, no-nonsense offseason training experience for 200+ student-athletes. 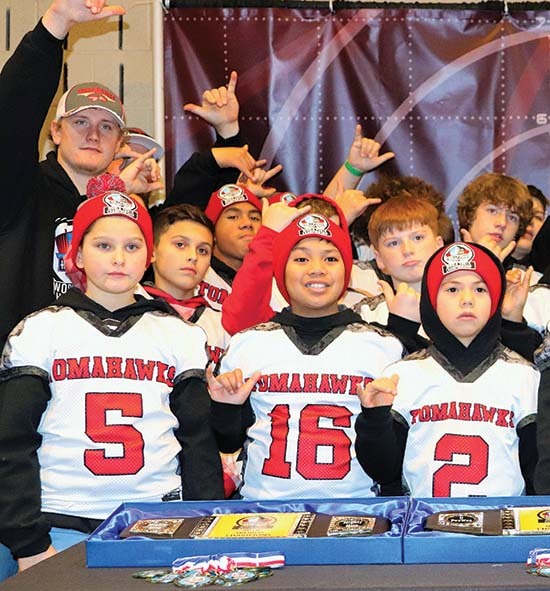 Among that pack of talented athletes were Tulalip’s own Shoshone Hollen, Noah Fryberg, Arnold Reeves, Quinton Yon-Wagner, and brothers Jeremiah and Jacob Diaz. 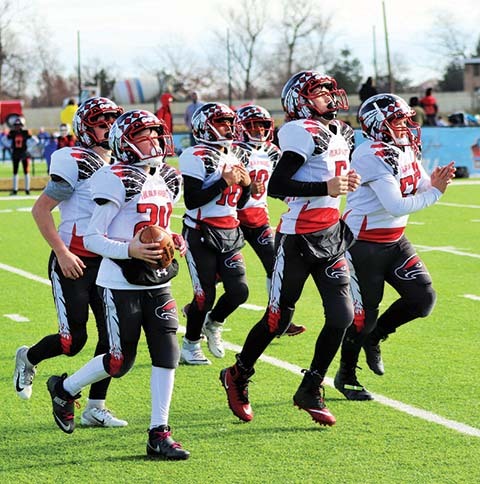 All eager and ready to become better players, Football University was their primary destination for the best coaching from a staff of NFL-experienced coaches. 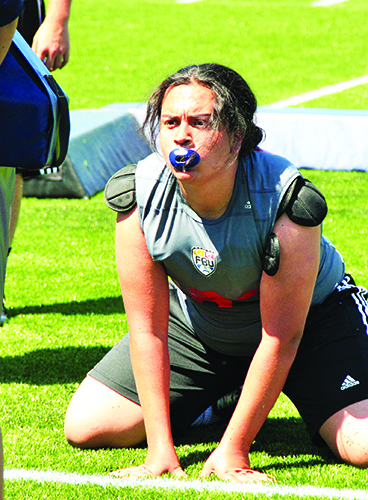 Since 2007, Football University has seen 40,000 student-athletes improve on the field and in the film room, learning position-specific techniques and fundamentals from the best and brightest. 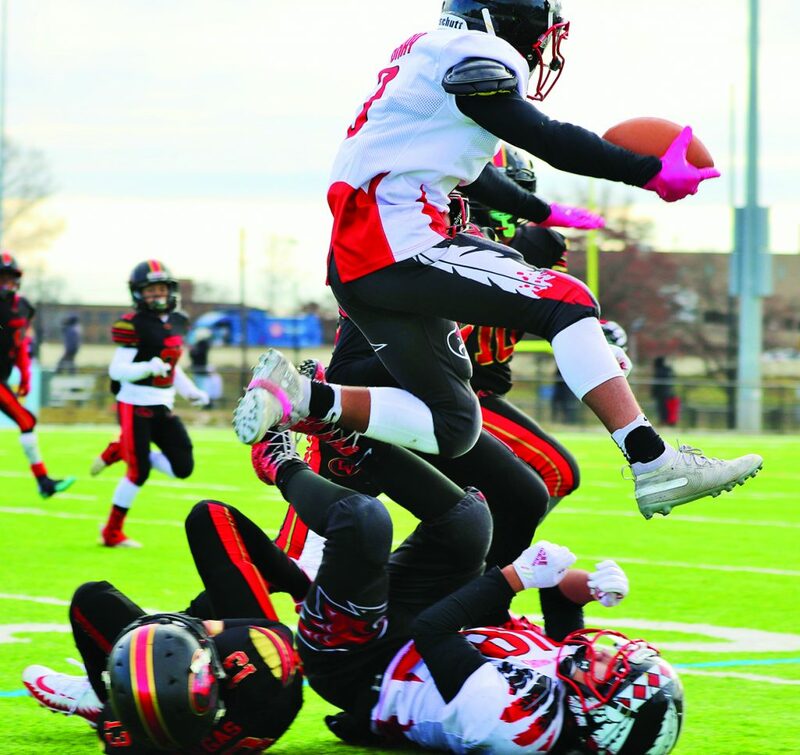 Promising prospects from grades 6-12 learn how to be better football players at a FBU camp, unlocking their potentials and eventually playing at the highest levels in high school, college, and the NFL. Football University is built on the truth that technique plus talent beats talent alone. 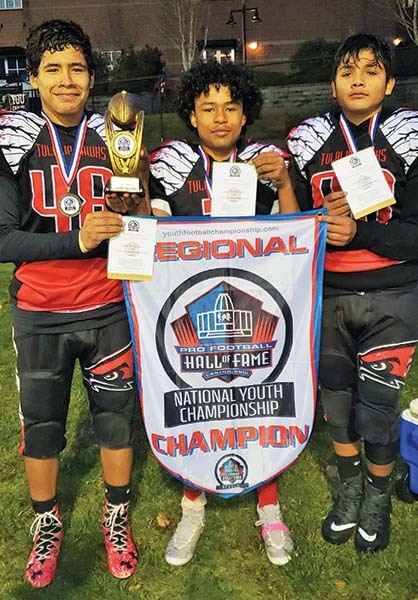 A truth the Tulalip youth learned by experience, as they were led by coaches and scouts in a variety of drills and trainings on the scorching hot gridiron. 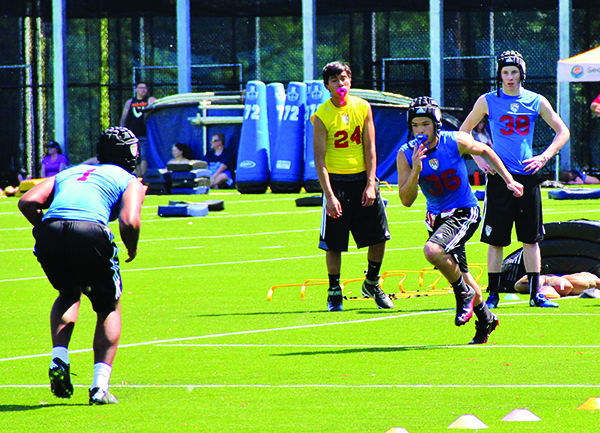 The camp tested their mental and physical football ability on the field and in the film room with an intense curriculum of technique training and film study. It is a proven belief that the competitive difference-maker at high levels of football is technique. 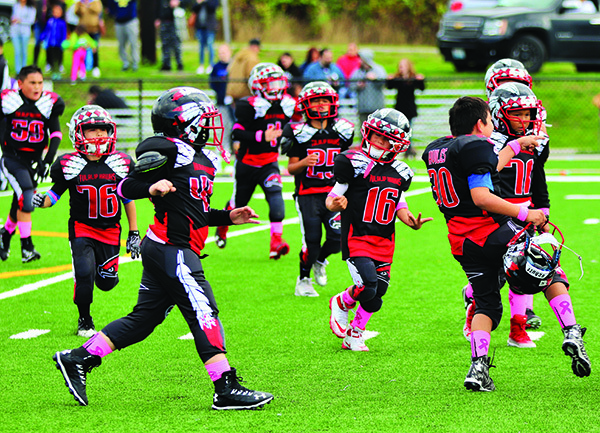 Every weekend in the fall, positional battles are won on the field with superior technique. 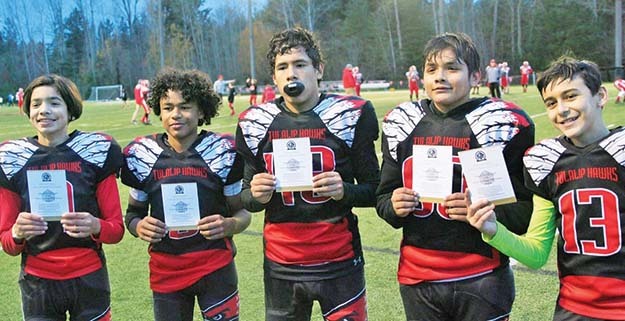 For their impressive showing at the camp, Noah, Shoshone, Quinton, and one of the Diaz brothers were recipients of a very exclusive FBU Top Gun Showcase invite. 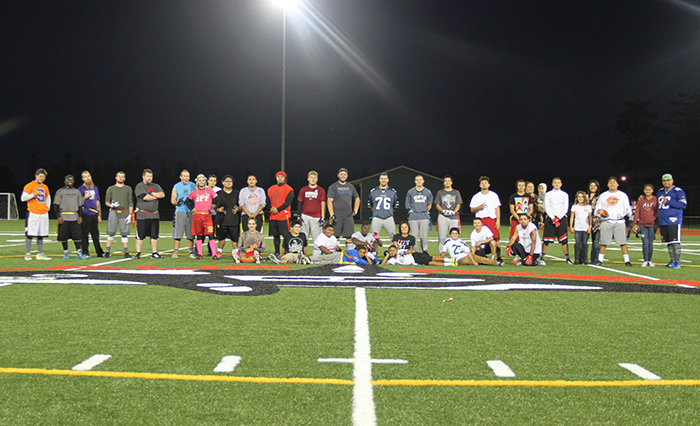 The Tulalip Tribes and Marysville School District kicked off Tulalip/Marysville Unity Month (#TMUnityMonth) on October 7, 2016, with Friday Night Lights. 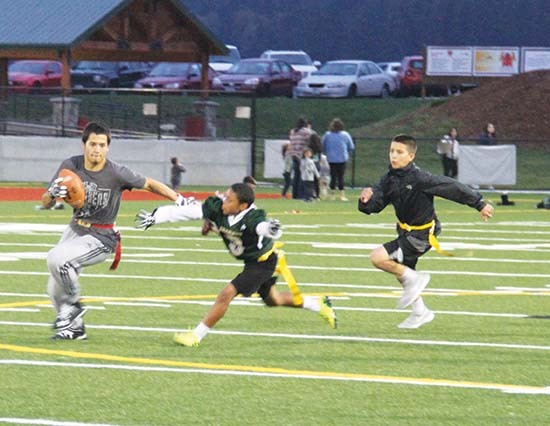 The event, hosted by Youth Services, is a flag football tournament that sees over 60 participants on the field every Friday. 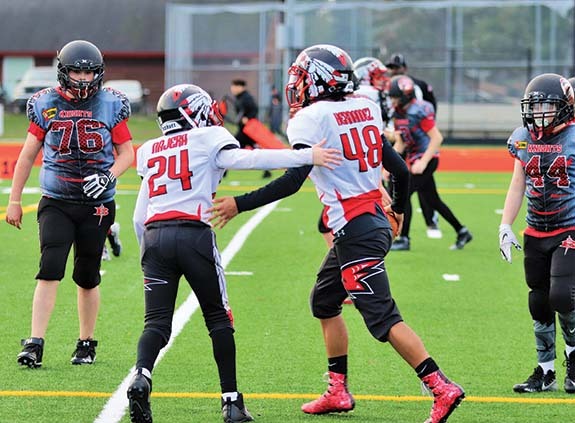 An all-ages event, Friday Night Lights participants get to play live, fast-paced football, while bonding with family and community members of Tulalip, Marysville, Everett, and Arlington. 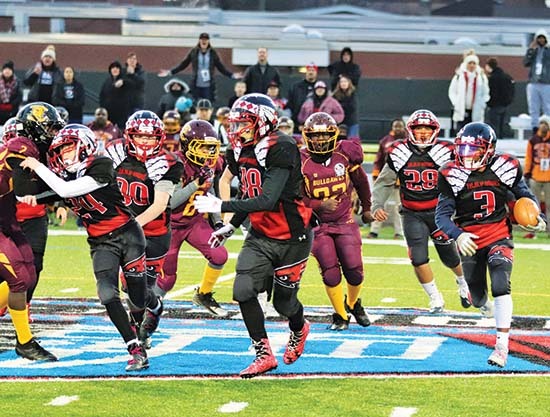 The event consists of four teams that will play each other every Friday night during the months of September to November. Youth Services provides snacks on the busy Friday nights to participants playing football, the young adults skateboarding the new skate park, and also caters to additional people taking part in indoor events such as open gym and movie nights. 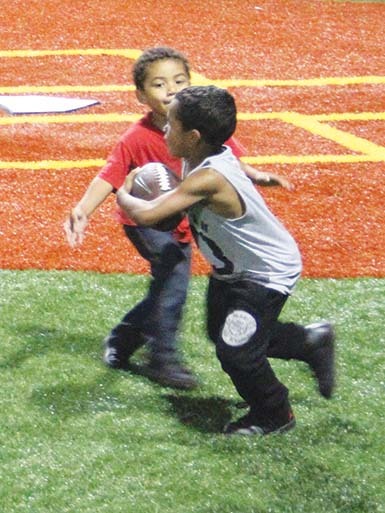 Friday Night Lights is held 5:00 p.m. to 8:30 p.m. every Friday night during the first few months of football season. Josh Fryberg, Youth Services Activities Coordinator, believes that building relationships is a major key to growing together as a community. 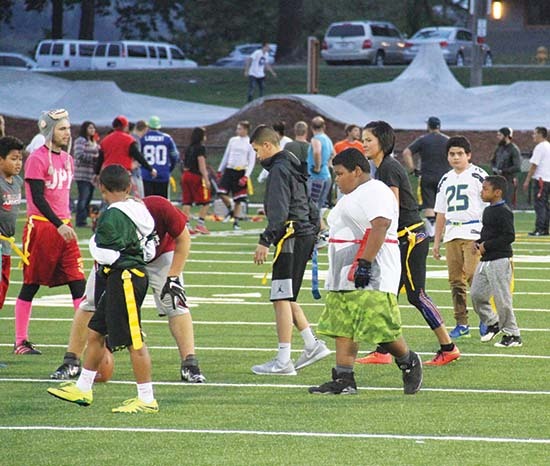 For more details about Friday Night Lights and #TMUnityMonth, please contact Youth Services at (360) 716-4909. 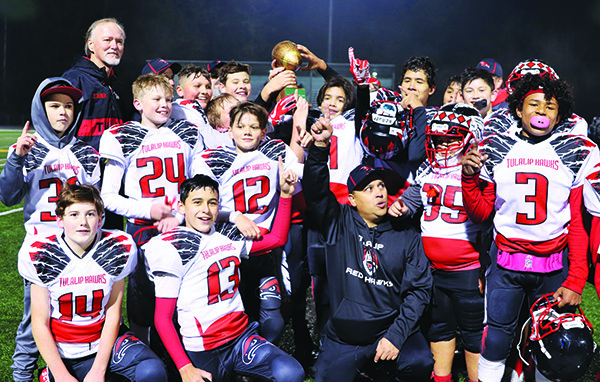 The Tulalip Heritage Hawks (0-1) held their home opening football game on Saturday, October 1, when they hosted the Bruins out of Clallam Bay (2-1). The game was played at the newly built Alpheaus “Gunny” Jones, Sr. ball field. 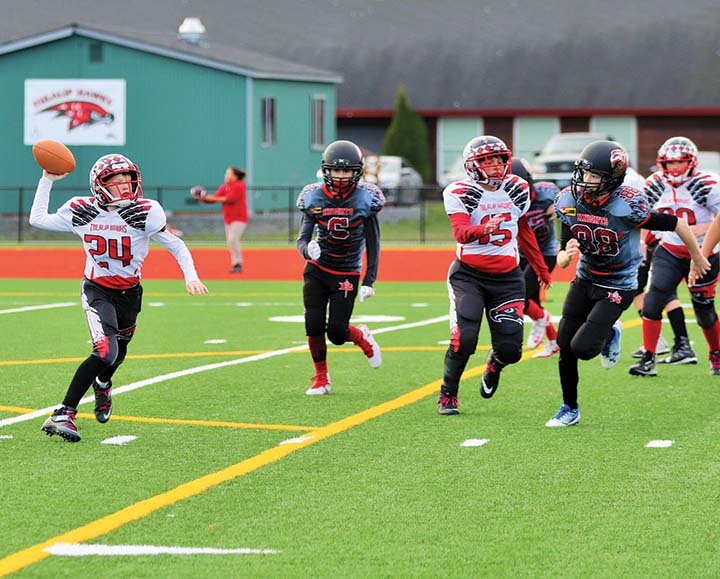 These two teams previously faced off on September 9 at Clallum Bay. That was a highly competitive game in which the Bruins pulled out a 28-26 victory. The Hawks were determined to get their first win of the short season and did what they could to show off for their home crowd. 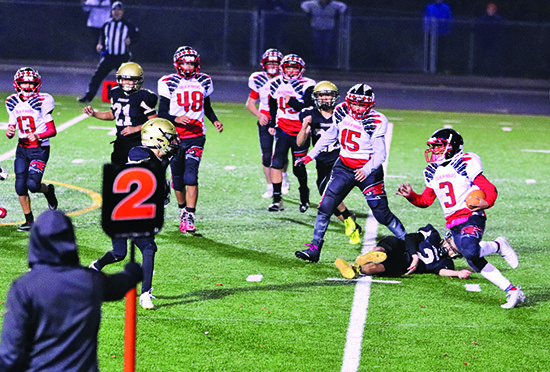 Everything seemed to go the Hawks way on both sides of the ball. The offense was clicking and had no trouble moving the ball. 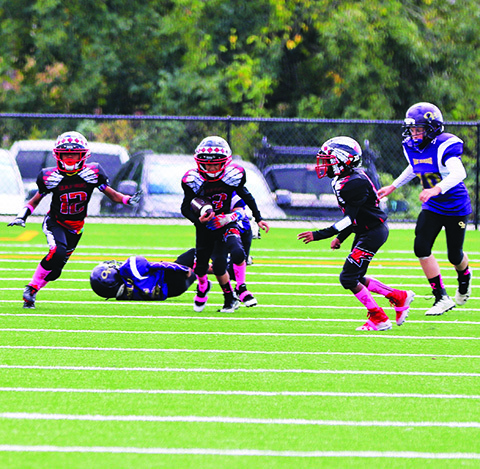 Meanwhile, the defense came up big by forcing three interceptions and a couple fumbles. After four quarters of solid play, the Hawks won by the score of 51-26. The twenty-five point victory is sure to be a shining spot on a season that has seen two games cancelled thus far. 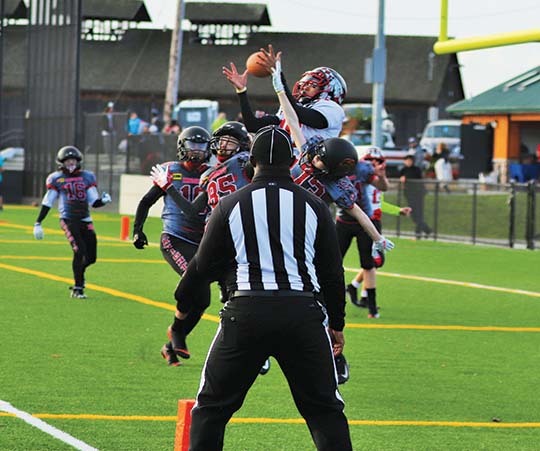 On Monday, October 3, it was announced Tulalip Heritage has forfeited its next game against the Lummi Blackhawks. 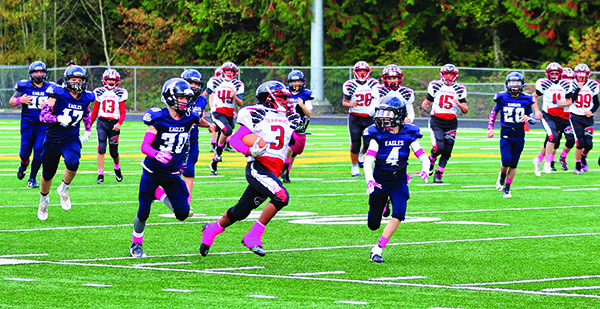 Saturday, October 29, is the next and last home game on the schedule for the Hawks.